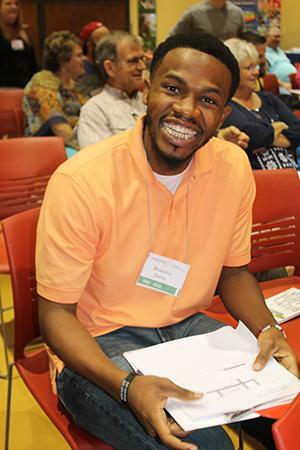 Photo right: Brandon Jones was a smiling participant at the Student Ministry Initiative Conference for youth leaders. Photo below right: Mark DeVries breaks away from his presentation to show his funny-side. Photo bottom right: The total number of participants joining the annual Student Ministry Initiative Conference was 250. Mississippi United Methodist youth leaders are sharing their takeaways following the annual Student Ministry Initiative (SMI) Conference. The conference featured leaders from Ministry Architects and a series of workshops over two days at Galloway Memorial United Methodist Church in Jackson, Mississippi. Abigail Herrington, the youth director at Hawkins United Methodist Church in Vicksburg, explains why she calls this conference different. "Most of the time when you come to workshops, it is a lot about theory, but these workshops have been more about how you create and implement something and I have been really appreciative. One of the workshops that I went to was about coordinating your volunteers and investing in your volunteers...the workshop gave me the tools to discuss with volunteers what we need from volunteers," said Herrington. Josh Gray came expecting to hear something that would enhance his ministry as the youth minister at Clinton First United Methodist Church in Clinton. "In the culture of youth ministry, there is always something to learn...I wish I could bring every church member that I have to events like this just so that they can hear what we are hearing from these ministry experts and leaders. When it comes to the lives of students, particularly middle and high school, they have never been busier. There is zero free time and so church over time has been set on the back burner, and it is not intentionally. This is the thing we have to remember," Gray stated. Mark DeVries, founder, and president of Ministry Architects and his team were lead presenters at the SMI Conference. He also spoke to the concern that children have a lot going on. "We think parents are not committed, but they are just reacting to a whole different reality which is, 'I don't work an eight to five, Monday through Friday anymore. My days off are weird. And if I get a day off with my family, it is probably going to be on Sunday sometimes.' I think we got to reimagine the way we think about church and what it means to be a faithful church member because what we have right now is isolated discipleship as attendance." 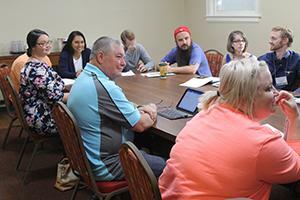 DeVries' message around connecting student's life at church and away from the church, is sticking with Casey Randolph, a youth leader at Anderson United Methodist Church in Jackson. She is creating a calendar that will include student activities away from the church. "This will allow the kids to get into each other's lives and support each other. So, if we have football player at a school, then we can all go and support that one player or cheerleader. And once we have a calendar made out, then we can work on our budget." Overall, "There is a real thriving for youth ministry in the Mississippi Conference," according to DeVries. He used the growing attendance at the annual conference-wide youth event The Gathering, and the formation of the conference's new Student Cohort to support his opinion. 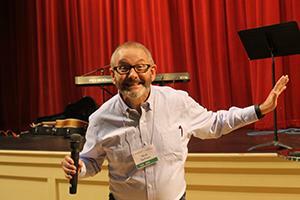 Pictures from the SMI Conference can be viewed by clicking here. For more information about The Gathering, click here. To read about the Student Cohort, click here.